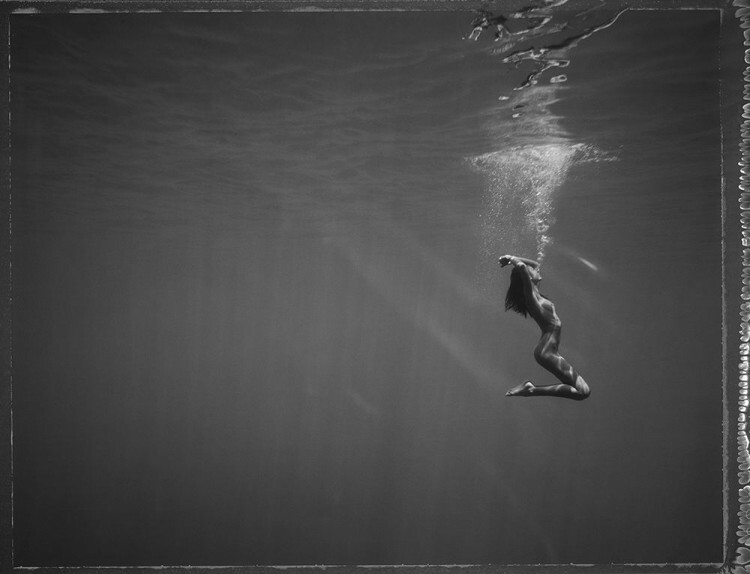 Floating Bits: Underwater Large Format photography | Film's not dead. The twin brother duo Ian and Erick Regnard work together as photographers and boy do they create beautiful work together! Born in Mauritius, a volcanic island in the Indian Ocean, their creative work leads them to the crystal clear waters of the Pacific Ocean where they use a mixture of a large format 4×5 Polaroid film and medium format 6×6 film to shoot underwater. The resulting photographs are just timeless. It started back in 2005 after a friend suggested that they visit an island in the Pacific where the water is so clear there is still visibility down to 60-100 meters. 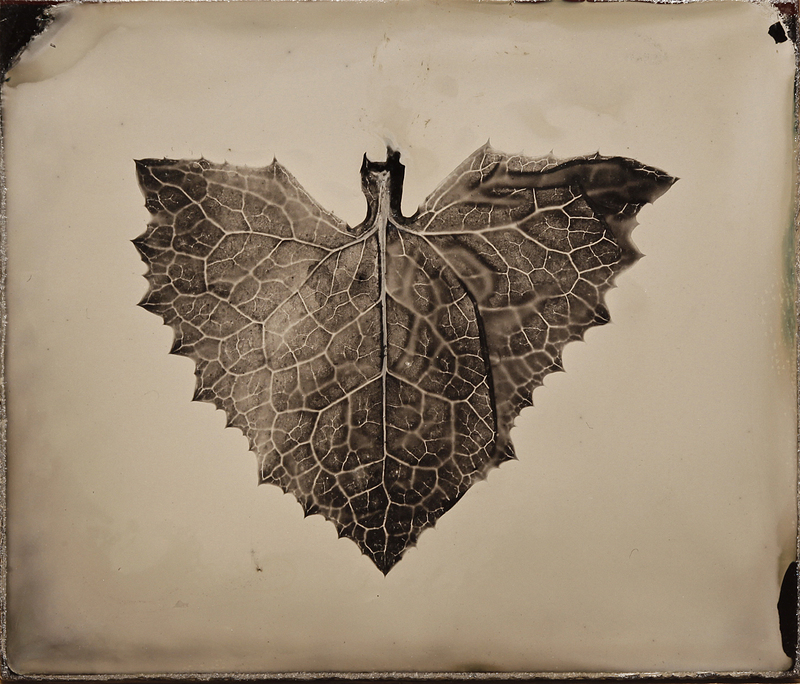 The duo spent a year researching the technical aspects of underwater 4×5 photography. We were lucky enough to be able to catch up with Ian Regnard who gave us some insight into how they work and what it takes to shoot underwater. Film’s not Dead: What would you say the pros and cons are for shooting large format photography underwater? Ian Regnard: I think the pros for us was really the satisfaction of getting a great shot on Large format film. You get great resolution but also you get something that is quite unique! The con is that it is a difficult process that takes time and money. Film’s not Dead: It looks incredibly complex and time consuming Could you explain to us the process you had to go through to achieve these photographs? Ian Regnard: Well the whole thing took us about a year in R&D (research & development) and then shooting it. I think this was the hard part. There was really not much information out there so we had to find a lot with talking to lots of people with different ideas. Everyone has got an opinion and you have to weave your own. Little things like, what lens should we use? What port should we use? A flat one? Or a Dome one? etc… etc…Once we realise that we needed a fix lens on our Linhof then it was again another process to get the below extended at the back of the camera. The Guys at Camera Electronic in Perth did it for us which was great. Then came the design of the housing. You need space for your slide sheet to come off the side… Once everything was constructed then came the testing. There are issues with manual focusing underwater. Also each time you take a shot, the camera will need to be brought to the surface and reloaded. The Housing was so big, we needed 15 kg around it to sink it! On location, heat was a problem. Our negatives were heating up in the middle of the ocean on a tropical island, so much so that coming back to our bungalow, some of the film’s emulsion was whipping off clean leaving a clear piece of plastic. We were in Tahiti for three weeks. Shooting eight hours a day and producing around one photo an hour! Film’s not Dead: What film did you use? Ian Regnard: The film we used was called PN55 which was a great film from Polaroid. It had a negative and a positive at the same time. 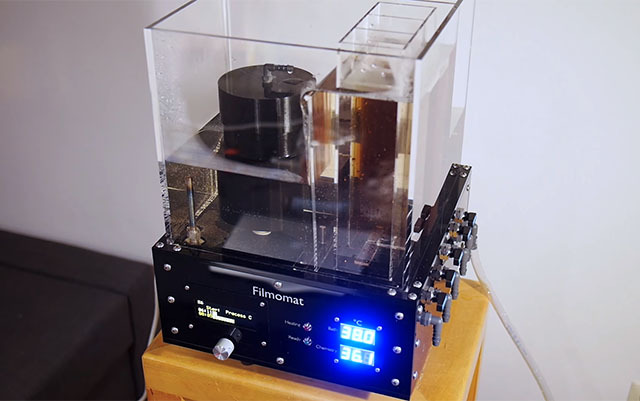 The beauty of the film is that it is processed straight away and you can wash it in plain water on Location so no need to rush to the lab to see what you might have taken. We knew the results straight away! Film’s not Dead: Why did you decide to use film? Ian Regnard: We come from a film background. Erick and I have been shooting for over 20 years so it wasn’t really new to us. But saying that we were shooting digital for a while back then and everyone was shooting Digital. Everyone was talking how film was dead. So we thought to bring back a bit beauty into the game. All my personal projects we shoot on Film! We love it. 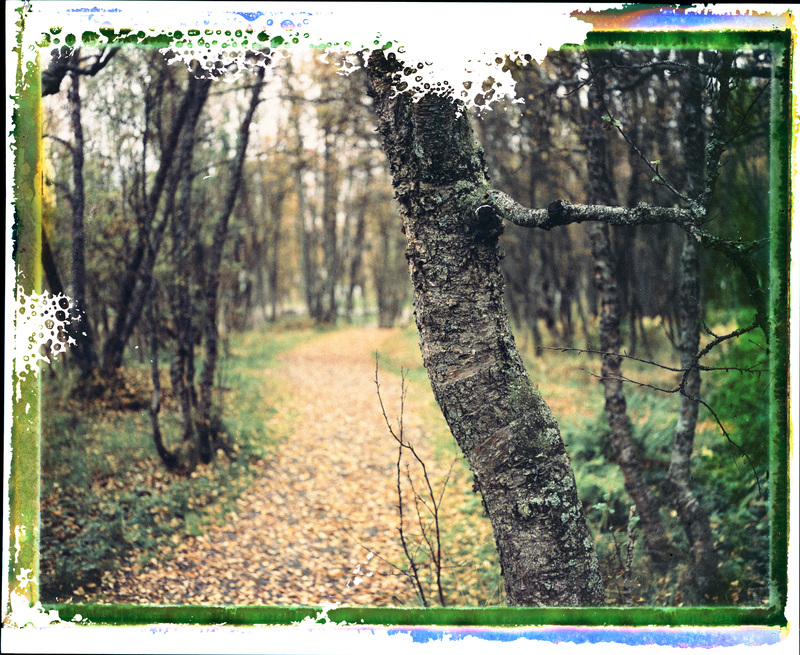 Using Hasselblad 503’s and Linhof sand even Holgas! It is such a different feel. And there is a romance with film that you don’t have with digital. Film’s not Dead: How did you manage to get a housing for a large format camera? 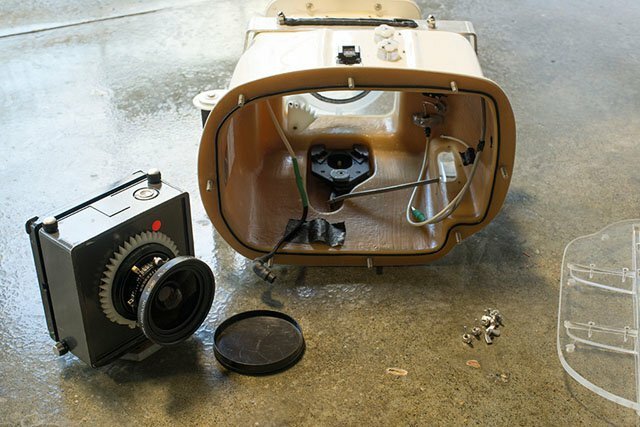 Ian Regnard: For whatever equipment you have as a photographer you can always find someone to build you an underwater housing. There are plenty of people that do so around the world, it is just a matter of what you like best in term of design and what suits your budget. We got someone in New South Wales to build us this housing. Film’s not Dead: We can’t even imagine how difficult it must have been focusing underwater. Could you walk us through how you managed to do that? 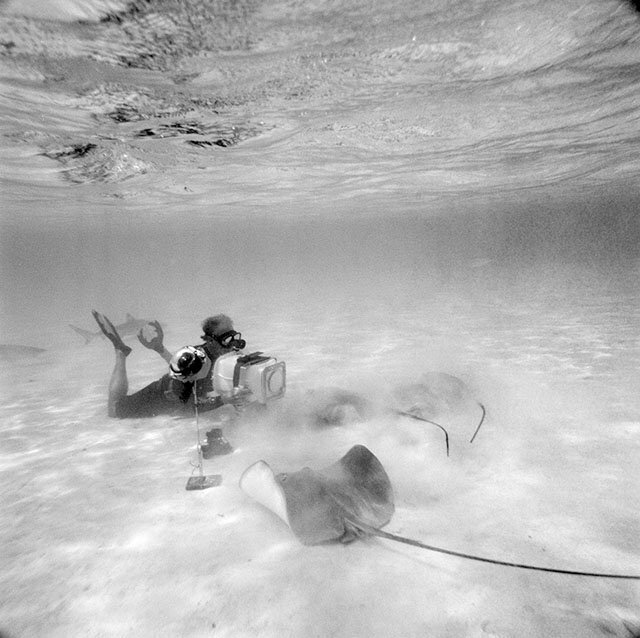 Ian Regnard: The focusing underwater becomes very tricky. The air between the lens and the port of the housing affects your focussing. There is a formula that you can use but unless you are very well versed with it it becomes very time consuming trying to calculate things underwater. What we did was to do a few test in a pool using a giant ruler and whatever we set the focus on the camera we then looking at where it was actually focusing underwater on the ruler. We made notes and then we used it in the field. We got our model to take the measuring tape to where we wanted her to be and then Erick would real it back in to be then ready to shoot, knowing that the film would be focused. Film’s not Dead: Have you tried the new Type 55 film underwater? Ian Regnard: No, I haven’t as yet as I still have a box of PN55 left but sure would love to use and check the comparison. Film’s not Dead: What projects have you got lined up for the future? Ian Regnard: We are working on some more underwater shots using models but we are playing with the idea of using a few girls and also maybe colour images. We are also in the process of publishing a portrait book on the ‘Locals of Hawaii’, which took six years to photograph. All shot on large format and medium format film.